Grady’s Gift is a division of The Sick Kids Foundation controlled by the Hospital for Sick Children. All donations can be made to the foundation in the name of Grady’s Gift. Receipts will be issued directly by the foundation and sent to you. Donate here. Much of the research that Sick Kids needs to do to help children with Hypoplastic Left Heart Syndrome (HLHS) isn’t funded by the government and must be raised privately. The techniques they’ve developed to help these children are very expensive. 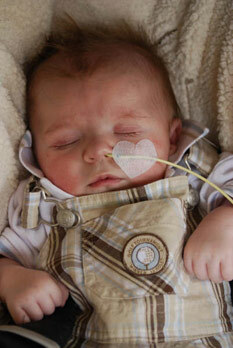 Hypoplastic Left Heart Syndrome is a rare heart defect . The left side of the heart is smaller than the right, often so small that the heart can’t pump blood out to the rest of the body. Sick Kids is one of the few hospitals in the world able to give children born with HLHS a good chance at life. 20 years ago none of these children lived. Today as many as 70% become happy , active children. Click here for more. Kevin and I realized when Grady was having his first operation that we didn’t qualify for any of the programs the hospital has in effect to keep the parents of critically ill children near by in case of emergency. Our vision for Grady’s Gift is two fold. We would like to improve the overnight rooms so parents can use them as a place to centre themselves, to regain the strength necessary to spend another day at the bedside and expand the parent overnight rooms so that more parents can be accommodated each night. Click here for more. Click here for a list of our partners!